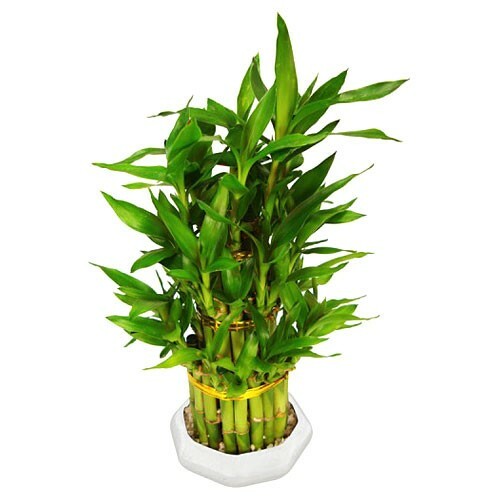 Lucky Bamboo is one of the plants that's recommended by Feng Shui masters and practitioners for improving Feng Shui and creating a space where you feel safe and more energized to meet the demands of today's high-pressured world. Not only does this plant add brightness with its brilliant green color, but is also believed to bring fortune and prosperity to any household, business or people who own it. The lucky bamboo can be sent for several occasions such as a wedding favor, party favor, baby shower, birthday, promotion, graduation, holidays celebration, and more. Ideal temperature is between 0 to 30 degree and indirect light. Quantities 3 layers of Bamboo stacked and tied together with a band.